Last December I discussed the NRC report, Discipline-Based Education Research: Understanding and Improving Learning in Undergraduate Science and Engineering. One of its themes is the importance of the adoption of “evidence-based teaching strategies.” It is hard to find carefully collected quantitative evidence that certain instructional strategies for undergraduate mathematics really are better. 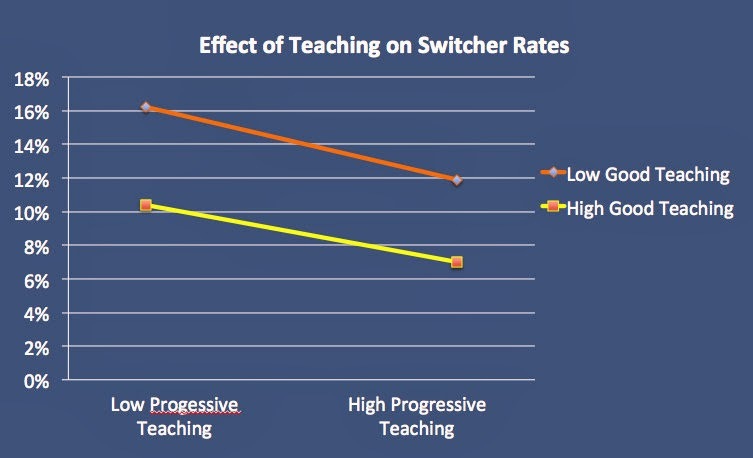 I was pleased to see two articles over the past month that present such evidence for active learning strategies. 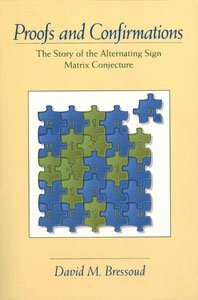 One of the articles is the long-anticipated piece by Jerry Epstein, "The Calculus Concept Inventory—Measurement of the Effect of Teaching Methodology in Mathematics" which appeared in the September 2013 Notices of the AMS . Because this article is so readily available to all mathematicians, I will not say much about it. Epstein’s Calculus Concept Inventory (CCI) represents a notable advancement in our ability to assess the effectiveness of different pedagogical approaches to basic calculus instruction. He presents strong evidence for the benefits of Interactive Engagement (IE) over more traditional approaches. As with the older Force Concept Inventory developed by Hestenes et al. , CCI has a great deal of surface validity. 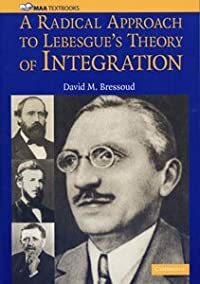 It measures the kinds of understandings we implicitly assume our students pick up in studying the first semester of calculus, and it clarifies how little basic conceptual understanding is absorbed under traditional pedagogical approaches. Epstein claims statistically significant improvements in conceptual understanding from the use of Interactive Engagement, stronger gains than those seen from other types of interventions including plugging the best instructors into a traditional lecture format. Because CCI is so easily implemented and scored, it should spur greater study of what is most effective in improving undergraduate learning of calculus. The second paper is "Assessing Long-Term Effects of Inquiry-Based Learning: A Case Study from College Mathematics" by Marina Kogan and Sandra Laursen . This was a carefully controlled study of the effects of Inquiry-Based Learning (IBL) on persistence in mathematics courses and performance in subsequent courses. They were able to compare IBL and non-IBL sections taught at the same universities during the same terms. IBL does this and also is expected to incorporate a structured curriculum that builds toward the big ideas, a component that may or may not be present in IE. For the Kogan and Laursen study, IBL was a label that the universities chose to apply to certain sections. The trained observers in the Kogan and Laursen study found significant differences between IBL and non-IBL sections. They rated IBL sections “higher for creating a supportive classroom atmosphere, eliciting student intellectual input, and providing feedback to students on their work” than non-IBL sections. IBL sections spent an average of 60% of the time on student-centered activities; in non-IBL sections the instructor talked at least 85% of the time. L2, an advanced junior/senior-level mathematics course with an emphasis on proofs. For L1 and L2, students did not know in advance whether they were enrolling in IBL or non-IBL sections. The IBL section of G1 was labeled as such. In all cases, the authors took care to control for discrepancies in student preparation and ability. IBL had the least impact on the students in the advanced course, L2. IBL students had slightly higher grades in subsequent mathematics courses (2.6 for non-IBL, 2.8 for IBL) and took slightly fewer subsequent mathematics courses (1.5 for non-IBL, 1.4 for IBL). For the introduction to proof course, L1, IBL students again had slightly higher grades in the following term (2.8 for non-IBL, 3.0 for IBL). There were statistically significant gains (p < 0.05) from IBL in the number of subsequent courses that students took and that were required for a mathematics major, both for the overall population (0.5 for non-IBL, 0.6 for IBL) and, especially, for women (0.6 for non-IBL, 0.8 for IBL). For L1, the sample size was large enough (1077 non-IBL, 204 IBL over seven years) to investigate persistence and subsequent performance broken down by student overall GPA, recorded as low (< 2.5), medium (2.5 to 3.4), or high (> 3.4). For the non-IBL students, differences in overall GPA were reflected in dramatic differences in their grades in subsequent mathematics courses required for the major, all statistically significant at p < 0.001. Low GPA students averaged 1.96, medium GPA students averaged 2.58, and high GPA students averaged 3.36. 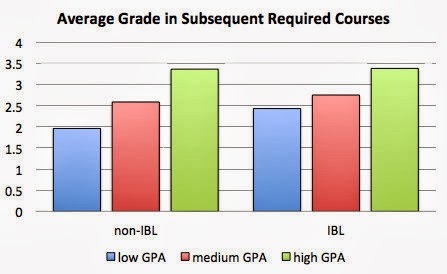 All three categories of IBL students performed better in subsequent required courses, but the greatest improvement was seen with the weakest students. Taking this course as IBL wiped out much of the difference between low GPA students and medium GPA students. It also decreased the difference between medium and high GPA students in subsequent required courses. 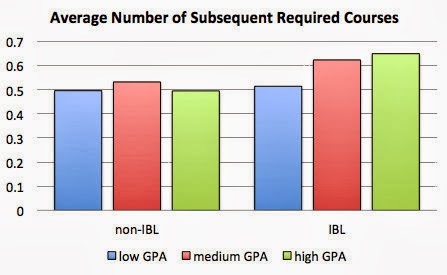 For IBL students, low GPA students averaged 2.43, medium GPA students averaged 2.75, and high GPA students averaged 3.38 in subsequent required courses. See Figure 1. Figure 1: Average grade in subsequent courses required for the major following introduction to proof class taught either as non-IBL or IBL. While the number of subsequent courses satisfying the requirements for a mathematics major was higher for all students taking the IBL section of L1, here the greatest gain was among those with the highest GPA. For low GPA students, the number of courses was 0.50 for non-IBL and 0.51 for IBL; for medium GPA the number was 0.53 for non-IBL, 0.62 for IBL; and for high GPA the number was 0.49 for non-IBL, 0.65 for IBL. See Figure 2. Figure 2: Average number of subsequent courses taken and required for the major following introduction to proof class taught either as non-IBL or IBL. For the first course in the sophomore sequence, G1, IBL did have a statistically significant effect on grades in the next course in the sequence (p < 0.05). The average grade in the second course was 3.0 for non-IBL students, 3.4 for IBL students. There also was a modest gain in the number of subsequent mathematics courses that students took and that were required for the students’ majors: 1.96 courses for non-IBL students, 2.09 for IBL students. These have been the highlights of the Kogan and Laursen paper. Most striking is the very clear evidence that IBL does no harm, despite the fact that spending more time on interactive activities inevitably cuts into the amount of material that can be “covered.” In fact, it was the course with the densest required syllabus, G1, where IBL showed the clearest gains in terms of preparation of students for the next course. IBL is often viewed as a luxury in which we might indulge our best students. In fact, as this study demonstrates, it can have its greatest impact on those students who are most at risk. In May this year, the National Center on Education and the Economy (NCEE) released its report, "What Does It Really Mean to Be College and Work Ready?" . The report is in two parts: Mathematics and English Literacy. It is based on a national study of the proficiencies required and actually used for the most popular associate’s degree programs at two-year colleges. Just a few weeks earlier, Jordan Weissman published a piece in The Atlantic, "Here’s How Little Math Americans Actually Use at Work" . That was based on a 2010 report written by Michael Handel at Northeastern University, "What Do People Do at Work? A Profile of U.S. Jobs from the Survey of Workplace Skills, Technology, and Management Practices" . This large-scale survey includes an assessment of what mathematics is actually used in the workplace. I hope that it will come as a surprise to no one that not everyone actually uses the contents of Algebra II in their work or that College Algebra taught in two-year colleges is essentially high school Algebra II. 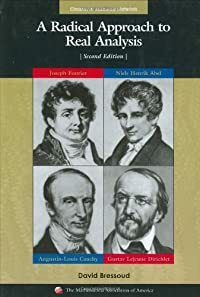 Weissman highlights Handel’s data that less than a quarter of all workers use any mathematics that is more advanced than fractions, ratios, and percentages. He raises the question whether requiring Algebra II for high school graduation is placing an unnecessary roadblock in the way of too many students. NCEE poses more nuanced questions. Why are so many students being hurried through the critical early mathematics that they will need to be work and college ready, especially fractions, ratios, and percentages, just so that they can get to Algebra II? Isn’t there a better way to prepare them for what they will need? Generally, the best paying and most desirable jobs are Upper White Collar (UWC) and Upper Blue Collar (UBC). We should be equipping our students so that they can aspire to such jobs. It’s still not true that everyone needs Algebra II, but 35% of UWC workers reported using basic algebra, geometry, and/or statistics in their work. This level of mathematics is even more important for UBC workers, with 41% reporting using mathematics at the level of basic algebra, geometry, and/or statistics. This is still not Algebra II (which Handel lists as “complex Algebra” as opposed to “basic Algebra”), which was reported being used by 14% of UWC workers and 16% of UBC workers. Much less is it Calculus, which was reported by 8% of both UWC and UBC workers. But about 40% of those working in UWC or UBC jobs need a working knowledge of some high school mathematics, a higher bar than simply having passed the relevant courses. It is interesting to observe that UBC workers are more likely to use mathematics than UWC workers. First, except for some work on geometric visualization, NCEE found no content in either College Algebra or Statistics, two college-credit bearing courses, that goes beyond the high school curriculum described in the Common Core State Standards in Mathematics (CCSS-M). They found that College Algebra had a large component of middle school topics, especially CCSS-M for grades 6–8 in Expressions and Equations, Functions, Number Systems, Geometry, and Ratios and Proportions. Statistics was a mix of CCSS-M middle and high school level statistics, with a significant component of grades 6–8 Ratios and Proportions and Expressions and Equations. Level 3: solve multi-step application of formal procedures, evaluate arguments, create models. NCEE did find three mathematical topics required for the introductory courses that are not covered in CCSS-M nor in the College Algebra or Statistics classes: complex applications of measurements, schematic diagrams (2-D schematics of 3-D objects and flow charts), and geometric visualization. They also found a much greater demand for knowledge of statistics, probability, and modeling (“how to frame a real-world problem in mathematical terms”) than is commonly taught in most mainstream high school mathematics programs today. What makes the NCEE report even more depressing is that it restricted its attention to college-credit bearing courses. Most of the mathematics taught at two-year colleges is below the level of College Algebra (see Figure 1). The mathematical requirements for UWC and UBC jobs may not be high, but we do not seem to be doing a very good job of preparing students even for what they will need. Figure 1. Fall term Mathematics course enrollments (thousands). “Introductory” includes College Algebra, Trigonometry, and Precalculus. All of this raises serious questions about whether Algebra II should be expected of all graduating high school students. This parallels the situation that has been my primary concern: Should Calculus be expected of all graduating high school students who are going directly into a four-year undergraduate program, especially those who may need to take Calculus in college? I would far prefer a student who can operate at PISA Level 3 in Algebra I over a student who cannot handle problems above Level 1 in Algebra II. I would prefer Level 3 in Precalculus over Level 1 in Calculus. When students are short-changed in their mathematical preparation simply so that Algebra II or Calculus appears on the high school transcript, with little regard to what that actually means, then neither they nor society as a whole are well served. It also raises questions about what mathematics should be required for an associate’s degree. College Algebra constitutes a significant hurdle for most two-year college students. Should there be alternatives? In this case, I believe that most two-year college students would be better served with a program that combines demanding use of the topics of Algebra I with a college-level introduction to Statistics. We are not at the point where we can demand Algebra II for high school graduation. To do so would either create unacceptable rates of high school failure or force us to change what we mean by “understanding Algebra II.” But I worry that if we simply lower our sights and decide that, since few of our students actually will use anything from Algebra II once they have graduated, it should not be expected for graduation, then that will actually weaken the preparation that occurs in the earlier grades. Elementary and middle school mathematics should be laying the foundation for a student to succeed in Algebra II. If we want our students to have a strong working knowledge of the high school mathematics that is needed for 40% of the UWC and UBC jobs, then we want them to have the mathematical preparation that would enable them to succeed in Algebra II. Student survey at start of term: We asked students how calculators and/or computer algebra systems (CAS) were used in their last high school mathematics class and how comfortable they are in using these technologies. Student survey at end of term: We asked students how calculators or CAS had been used both in class and for out of class assignments. Instructor survey at start of term: We asked instructors what technologies would be allowed on examinations and which would be required on examinations. Our first question asked students how calculators were used on exams in their last high school mathematics class (see Figure 1). As in previous columns, “research” refers to the responses of students taking Calculus I at research universities (highest degree in mathematics is doctorate), “undergrad” refers to undergraduate colleges (highest degree is bachelor’s), “masters” to masters universities (highest degree is masters), and “two-year” to two-year colleges (highest degree is associate’s). Figure 1. GC = graphing calculator. CAS = graphing calculator with computer algebra system capabilities (e.g. TI-89 or TI-92). There are several interesting observations to be made from this graph. 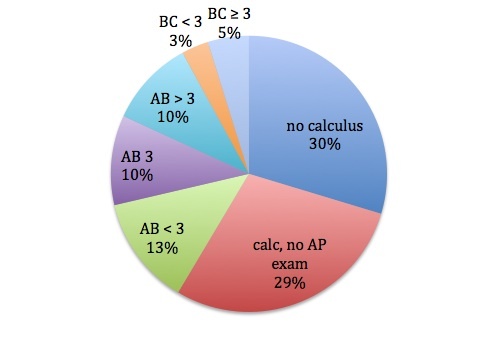 First, not surprisingly, almost all Calculus I students reported having used graphing calculators on their exams at least some of the time (“always” and “sometimes” were mutually exclusive options). Second, there is a difference by type of institution. Students at undergraduate colleges were most likely to have used graphing calculators on high school exams (94%), then those at research universities (91%), then masters universities (86%), and finally two-year colleges (77%). The differences are small but statistically significant. My best guess is that these are reflections of the economic background of these students. A second observation is that for most students, access to a graphing calculator was not always allowed. However, it is still common practice in high schools (roughly one-third of all students) to always allow students to use graphing calculators on mathematics exams. Another striking observation from Figure 1 is that the percentage of students who were always allowed to use graphing calculators on exams is almost identical to the percentage of students who were always allowed to use graphing calculators with CAS capabilities on exams. For all categories of students, over half of them were allowed to use graphing calculators with CAS capabilities at least some of the time, which suggests that over half of the students in college Calculus I own or have had access to such calculators. The next graph (Figure 2) shows how students at the start of the term reported their comfort level with using graphing calculators or computer algebra systems (Maple and Mathematica were provided as examples of what we meant). The most interesting feature of this graph is that students at two-year colleges are much more likely to be comfortable with Maple or Mathematica than those at four-year programs. I suspect that the reason behind this is that most Calculus I students at two-year colleges are sophomores who took pre-calculus at that college the year before. This gave them more opportunity to experience these computer algebra systems. Figure 2. Student attitude toward use of graphing calculator or CAS on a computer such as Maple or Mathematica. The graphs in Figures 3–5 show what students reported at the end of the term about use of technology. For the graph in Figure 3, students were asked how frequently each of these occurred in class. Percentage shows the fraction of students who responded “about half the class sessions,” “most class sessions,” or “every class session.” We note large differences in instructor use of technology generally (for this question, “technology” was not defined), and especially sharp differences for instructor use of graphing calculators or CAS (with Maple and Mathematica given as examples). It is interesting that students are most likely to encounter computer algebra systems in undergraduate and two-year colleges, much less likely in masters and research universities. Figure 3. End of term student reports on frequency of use of technology (at least once/month). For this question, CAS refers to a computer algebra system on a computer, such as Maple or Mathematica. The first two sets of bars in Figure 4 show student responses to “Does your calculator find the symbolic derivative of a function?” The first set gives the percentage responding “N/A, I do not use a calculator.” The second set displays the percentage responding “yes.” Looking at the complement of these two responses, we see that across all types of institutions, roughly 50% of students taking Calculus I own a graphing calculator without CAS capabilities. The third set records the percentage responding “yes” to the question, “Were you allowed to use a graphing calculator during your exams?” Note that there are some discrepancies between what students and instructors report about allowing graphing calculators on exams (Figures 4 and 6), but the basic pattern that graphing calculators are allowed far less frequently at research universities than at other types of institutions is consistently demonstrated. Figure 4. End of term student reports on calculator use. No calculator = do not use a calculator. Calculator with CAS = use a calculator with CAS capabilities. Calc allowed on exams = graphing calculators were allowed on exams. We also asked how often “The assignments completed outside of class time required that I use technology to understand ideas.” Again, we see much less use of technology at research universities, the greatest use at undergraduate and two-year colleges. Figure 5. Frequency with which technology (either graphing calculators or computers) was used for out of class assignments. Almost never = less than once per month (includes never). Sometimes = at least once per month but less than once per week. Often = at least once per week. The last two graphs (Figures 6 and 7) are taken from the instructor responses at the start of the term: what technology they would allow on their exams and what technology they would require on their exams. Again, we see a clear indication that technology, especially the use of graphing calculators without CAS capabilities, is much less common at research universities than other types of institutions. It is interesting to observe that there are large numbers of instructors who allow but do not require technology on the exams. At research universities, 26% require the use of some kind of technology, and a further 25% allow but do not require the use of some sort of technology. For undergraduate colleges, 38% of instructors require technology, an additional 42% allow it. At masters universities, 42% require, and a further 33% allow. At two-year colleges, 52% require, and an additional 36% allow. Figure 6. Start of term report by instructor of intended use of technology on exams. GC = graphing calculator. 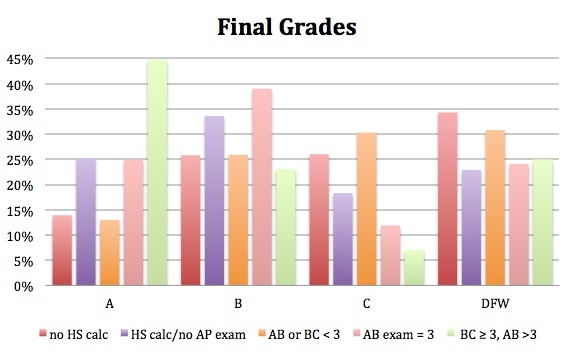 Most of those who checked “other” reported that they allowed graphing calculators on some but not all parts of the exam. Some reported allowing only scientific calculators. Figure 7. Start of term report by instructor of intended use of technology on exams. GC = graphing calculator. Most of those who checked “other” reported that they required graphing calculators on some but not all parts of the exam. Some reported requiring only scientific calculators. 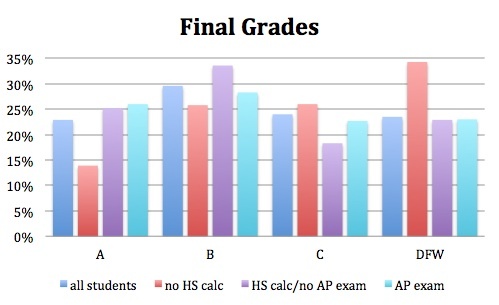 We see a pattern of very heavy use of graphing calculators in high schools, driven, no doubt, by the fact that students are expected to use them for certain sections of the Advanced Placement Calculus exams. They are still the dominant technology at colleges and universities, but there the use is as likely to be voluntary as required. This implies that in many colleges and universities questions and assignments are posed in such a way that graphing calculators confer little or no advantage. The use of graphing calculators at the post-secondary level varies tremendously by type of institution. Yet even at the research universities, over half the instructors allow the use of graphing calculators for at least some portions of their exams.